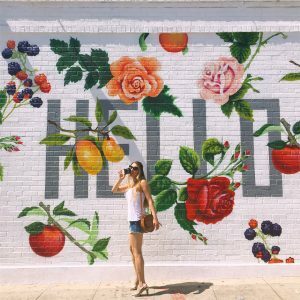 Wall to wall guide for the city of angels - Instagramable L.A.
Wanna snap that shot with the perfect instagramable wall? Today I’m gonna take you to the city of angels. 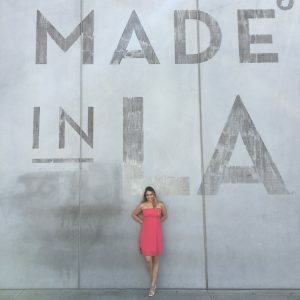 On my last trip to california I visited a bunch of these famous L.A. spots and planned a route to drive from Downtown L.A. towards Santa Monica. I promised this article to some of you on Instagram. This way you won’t have to plan the route yourself. And whether you’re still dreaming of Los Angeles or you’ve already got your next trip planned, grab a coffee and enjoy the read. We started on the hip Melrose Avenue at the “Made in L.A.” wall. It’s located just around the corner from the Cisco store. Once you’re there stop by the store. They also sell the “Made in L.A. “shirts and bags, so it’s definitely worth it. And since you’re already near, just cross the street and visit the rainbows. 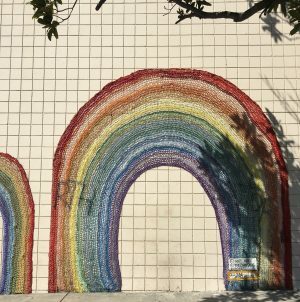 It wasn’t until then that I realised the rainbows aren’t painted but crochet attached to the wall. There’s another Turquoise wall across the street and a little painting of the cookie monster. If you like, check it out on my instagram feed. 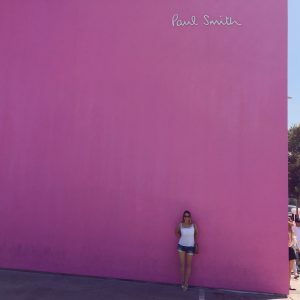 The famous pink wall was up next. It’s pretty huge, so make your friend or photographer step back a bit to capture the writing on top of the building. And beware of the security staff or just don’t lean on the wall. I definitely recommend stopping by Carrera café for the iconic coffee. You can choose pretty much any design for the print on top. 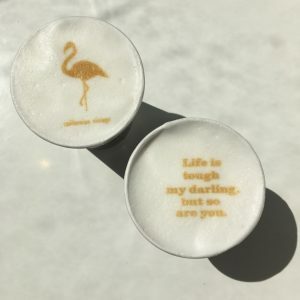 Whether it’s Ryan Gosling smiling at you from the foam of your latte or an inspirational quote, you name it. If you wanna go all wild, install the Ripple app to have your own pic printed on your coffee. Right outside Carrera café you’ll find their famous mural. Don’t be surprised if you find flowers where you assumed to find kisses. It’s being repainted every once in a while. So you’ll never really know what to expect. Probably the mural with the angel wings is the most known wall. But actually in the city of angels you will find those wings in several spots. 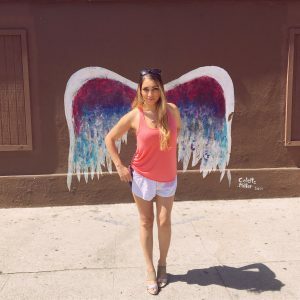 I snapped my picture with the pair of wings on West 3rd Street. It’s the artist’s way to remind humanity that we are the angels of earth. Remember my article about Cape Town’s Neighbourgoods market in the Old Biscuit Mill? http://jetstreamsforthegoodlife.com/neighbourgoods-market You’ll find a huge pair of Colette Miller’s angel wings right next to the entrance. Last but not least you wanna head to Culver City and stop at the red mural. Capture the good vibes of this mural full of love. When you leave this spot it’s only 10 more minutes by car to Santa Monica. By now you’ve probably taken enough pictures. So forget about content. Let your soul dangle, soak up the sun and enjoy the beach. You deserve it! great info will definitely visit these addresses when I am in LA next. danke für dein Feedback. Das freut mich total, vor allem, wenn es von einem L.A. Fan wie dir kommt. Lass doch wieder von dir hören, wenn du die Spots besucht hast. Thanks for your post, darling. Is Carrara Café next to Paul Smith? I have to check out my pics to see if it was the cool mural you posted here.